Jill has just returned home from college to the rural farm community where she grew up, only to discover that her parents have mysteriously vanished. Learning that her father, a banker, has become the local pariah for overseeing land foreclosures on local farmers, Jill quickly becomes the victim of a series of strange and increasingly depraved assaults. With only her childhood friend and former lover, Gary, and his mentally unstable brother, Mervo (Tiny Tim), willing to believe her, Jill begins to fear for her life. 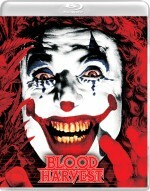 All the while, a stocking-masked killer is abducting, torturing, and brutally killing those closest to Jill… An unrelentingly grim and perverse psycho-sexual thriller, BLOOD HARVEST mixes gruesome throat slashings, copious amounts of T&A, and an unhinged supporting performance from music sensation, Tiny Tim. Long available only in heavily cut and grey market editions, Vinegar Syndrome proudly presents BLOOD HARVEST on Blu-ray, fully uncut, uncensored, and newly restored in 4k from its recently discovered original camera negative.